This loaded potato dish originated in Canada, but now counts many stateside consumers among its fans. Instead of the standard base of french fries, chef Bristol varies the preparation slightly by first steaming the potatoes, then dusting them with an herbed flour coating before frying. 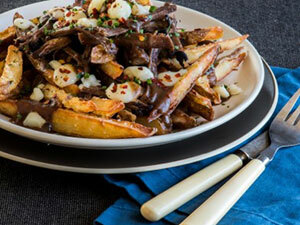 He serves the poutine with a topping of housemade braised brisket, cheese curds and gravy. 1. Prepare braised brisket: Preheat oven to 350 F. Generously season brisket with salt and pepper. In large skillet over medium-high heat, heat 1 tablespoon oil. Add brisket and sear until dark brown on both sides. 2. Transfer brisket to a large braising pot. Add celery, carrots, onions, wine, stock, thyme and parsley. Cover and place in preheated oven. Cook 3 hours or until meat is tender and shreds easily. Remove brisket and cover with foil; set aside. 3. Strain braising liquid and discard vegetables and herbs. Pour liquid back into braising pot, skim off any fat. Over high heat, bring liquid to a simmer. Cook until reduced by one-fourth. 4. In small saucepan, stir together remaining ½ cup oil and flour to make a roux. Whisk together over medium heat for 10 to 15 minutes, until mixture turns light brown. 5. Stir roux into reduced braising liquid, whisking to combine. Bring to a simmer over medium heat, stirring occasionally until sauce thickens. Season to taste with salt and pepper. Shred brisket into medium-size pieces and add to sauce; keep warm. 6. Prepare potatoes: In deep fryer, heat oil to 350 F. Combine flour, cornstarch, herbs de Provence, salt and pepper. 7. Cut steamed potatoes into lengthwise strips. Dredge potatoes in flour mixture, then fry in batches for 2 to 3 minutes until golden and crispy. 8. To serve, layer potatoes onto large platter. Top with brisket pieces and about 2 cups reduction sauce. Add cheese curds, parsley and chives. Serve immediately.